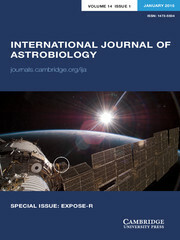 International Journal of Astrobiology is the peer-reviewed forum for practitioners in this exciting interdisciplinary field. Coverage includes cosmic prebiotic chemistry, planetary evolution, the search for planetary systems and habitable zones, extremophile biology and experimental simulation of extraterrestrial environments, Mars as an abode of life, life detection in our solar system and beyond, the search for extraterrestrial intelligence, the history of the science of astrobiology, as well as societal and educational aspects of astrobiology. Occasionally an issue of the journal is devoted to the keynote plenary research papers from an international meeting. We think we’re the first advanced earthlings—but how do we really know?